That's why The Register can appreciate an e-tailer with a unique business model. A hawk-eyed El Reg reader points out that UK online retailer Ebuyer.com appears to be cutting costs by running its site on servers dating back to the late Cretaceous period - roughly speaking. 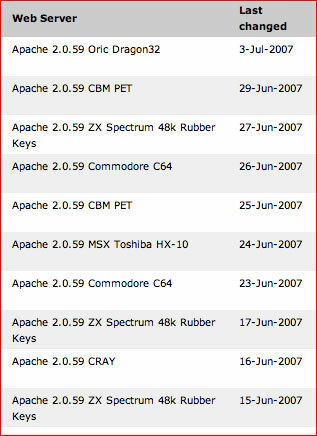 According to internet monitoring company Netcraft, the e-tailer has bypassed run-of-the-mill legacy servers for some serious heirlooms. For starters, there's a Toshiba HX-10, built in 1983. The HX-10 features 64KB of RAM, a 3.6MHz CPU, and a stunning 256x192, 16-color hi-res mode. Next, you'll find not one but two Commodore 64s. 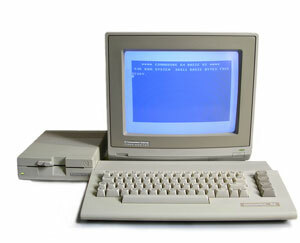 The Commodore debuted in 1982 with 64KB RAM, a 1.02MHz MOS Technology 6510 processor, and a 16-color, 320x200 resolution monitor. Not to mention a creamy BASIC 2.0 operating system. Then comes the Dragon32, a machine that arrived in 1982 featuring partial compatibility with the Tandy TRS 80 color series. Its Motorola 6809E processor clocks in at 0.89 MHz and runs Microsoft Extended BASIC. But clearly the real workhorses of the operation are the three ZX Spectrums. These babies were also made in 1982, used a Z80 processor running at 3.5 MHz, and offered up 128KB of memory - a great way to run that Sinclair BASIC operating system. Ebuyer says they "never stop improving our world class operation by putting our customers - and their needs - first." But holy crap, guys - there's selfless and then there's selfless. We'll pitch in a five spot so you can get that Amiga 1000 you've been eyeballing.